ww2dbaseArthur Seyß-Inquart (also spelled as Seyss-Inquart in western publications) was born Arthur Zajtichin in Stonařov, Moravia, Austria-Hungary, to a school teacher. His family changed their names to Seyß-Inquart after they moved to Vienna in 1907. During WW1, he served with the Austrian Army and served in Russia, Romania, and Italy. After the war, he continued his pre-war studies in law and set up his own practice in 1921. He became an active politician, named a State Councillor in 1937 and then Minister of the Interior in 1938. He joined the Austrian chapter of the Nazi party in 1931, and again renewed his membership in 1936. After Kurt Schuschnigg resigned as Chancellor at Adolf Hitler's pressure, Seyß-Inquart filled in the role Schuschnigg had left, and a day later allowed German troops to march across the border. 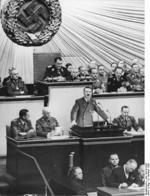 Two months before Germany annexed Austria, he had already met with Hitler at Linz, making known his support for the German attempt for annexation; after the annexation, he actively participated in drafting the policies to incorporate Austria into Germany. 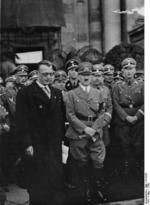 Hitler rewarded his support by naming him as the governor (Reichsstatthalter) of Ostmark (as Austria was known after annexation) and he was given a honorary SS rank. On 11 Mar 1939, he travelled to Czechoslovakia in attempt to sway politicians there to support a similar annexation, which took place two days later. ww2dbaseAfter WW2 broke out in Europe, Seyß-Inquart became the deputy to the military government in Poland. He was charged with committing atrocities in Poland, including rounding up Polish Jews into ghettoes. In May 1940, he was appointed the High Commissioner of the Netherlands. He forcibly asserted Nazi ideologies onto the Dutch people, and created his own version of a secret police organization to enforce his rule. In the Netherlands, he was accused of killing more than 3,000 people for political reasons. He administered several concentration camps in the Netherlands, forcibly extracting labor from Dutch workers. Over the course of the war he also deported millions of unwilling Dutch civilians to Germany to work in the German factories. Like most Nazi party members, his policies centered on anti-semitism; he began sending Dutch Jews to death camps in Feb 1941. By the end of the war he had sent 117,000 of the Netherland's 140,000 Jews to concentration camps, a charge he later adamantly denied, claiming that he was a puppet ruler while the German military held the executive powers in occupied Netherlands. Regardless, very few of the Jews returned home after the war. His apathy for the conquered Dutch people again showed in his defensive strategies later in the war when Allied troops marched near: he tactically opened the flood-control dams to drive back Allied advances, in the process flooding valuable farmlands that the Dutch desperately needed to survive (30,000 Dutch did starve to death during the war). Gradually, his powers were transferred to the German military, but he remained the High Commissioner. ww2dbaseOn 30 Apr 1945, Seyß-Inquart contacted Dwight Eisenhower's headquarters to negotiate a truce, knowing that his garrison could not hold on to the Netherlands indefinitely, especially as Germany collapsed. He agreed to allow Allied aid efforts to enter the country to prevent a wide-spread starvation, while requesting to be treated cordially as prisoners of war when Berlin capitulated. ww2dbaseAfter the German surrender, Seyß-Inquart was arrested in Hamburg on 8 May 1945 by Canadian troops. He was sentenced to death at the Nuremberg Trials for his war crimes and crimes against humanity, and the hanging was carried out on 16 Oct 1945.
ww2dbaseSources: Crusade in Europe, Jewish Virtual Library, Wikipedia. 22 Jul 1892 Arthur Seyß-Inquart was born. 18 May 1940 Arthur Seyß-Inquart was appointed Reich Commissar of the Netherlands. 16 Oct 1946 Arthur Seyß-Inquart passed away. Pokud budete mít zájem o fotografie rodného domu ve Stonařově, napište. Poskytnu zdarma.Ale prosím o žádost v češtině.